Promotion-chasing Peebles Rovers were the visitors on Saturday to Warner Park, where Eyemouth were waiting to make amends for the previous week’s bad result against local rivals Duns. Peebles started strongly and were soon testing stand-in keeper Andrew Gillie, but it was the hosts who scored first when Alan Jess latched on to a clearance on the edge of the box and fired into the top right-hand corner. The lead was short-lived as Peebles grabbed an equaliser when Gordon McInnes was caught in possession and Scott Sutherland made no mistake in slotting past Gillie. Eyemouth regained the lead when a shot from the right was deflected to Sean Ford, who made no mistake from inside the box to take the fishermen in 2-1 up at half-time. 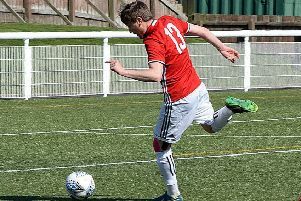 Peebles equalised early in the second half through Paul Murray and took the lead in the 77th minute when Daniel McAleavey scored from a corner kick. Four minutes later, the visitors were in the ascendancy again when Sutherland was allowed a straight run on goal. Eyemouth’s misery was completed when a free kick was floated into the box for the same man to knock in right on full-time.